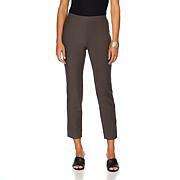 The perfect any-season pant. The stretch blend and the design make it an instant must-have. Whether you need a go-to for the office or your looking to have a more transitional style for the seasons, this pick gives you room to move and looks polished every time. Marla - don't make me wait on these pants again. I have about five pairs of black, a khaki (not sure if stone), white, and navy. I'll most likely buy all colors. Keep 'em coming! These pants are fabulous!! Fit and comfort is perfect . Look so upscale! Got compliments from strangers! Worth the higher price- you get what you pay for !! I love love love these pants! They make me feel polished! The fabric feels great and the pants are well made. This designer really pays attention to detail. This is my first purchase of this line of pants and they do not disappoint. Bought my usual size 16 and the fit is great! Except I wanted these pants to hit me above the ankle but no. They hit me below the ankle. They are not 30 inch inseam. I have a couple of pairs that are 30 inch and they are above the ankle. I am 5 ft 7 and I wanted to show my sandals in spring and summer when wearing. I reluctantly sent these back. Marla please bring in more navy pants in petite. I wanted to get a pair of those but they were sold out. I originally bought the medium which didn't work out for above the ankle. Love the look.